I neglected to mention in an earlier post the tradition of the Maypole which predates Christianity in Northern Europe and Britain. Apparently the early symbolism of the Maypole has been lost, though many link it to fertility rites, the worship of trees and/or the celebration of Spring. I like the worship of the trees' idea. The fertility rites one could be interesting - I always liked a "Paul Jones" dance - maybe Maypoles were a little like those dances only with ribbons. So perhaps the fact that people decorate hydro poles in towns and cities is a throw back to these ancient times when people worshipped trees, celebrated spring and generally created a focal point to draw people out. The Protestant Reformation banned a lot of these ancient traditions - but I have to believe that many went "underground" so to speak. In spite of all the conditioning that any particular culture has used to curb our natural instincts, there is still something very primeval that runs in our veins and surfaces from time to time - possibly around hydro poles or in sculptured corn fields or on moonlit nights when the ghosts of our ancestors call to us - come out and play!! 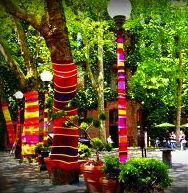 The idea is a little crazy perhaps - so is yarn bombing, really.